As Puerto Rico approaches the first month anniversary of Hurricane Maria, only small amounts of incremental progress have been made restoring the island’s telecommunications networks badly damaged by the storm. 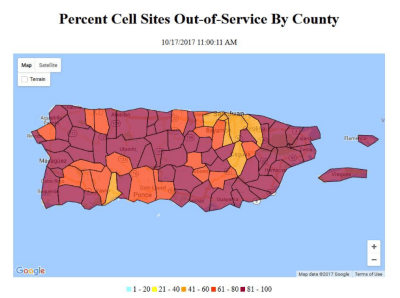 According to the Federal Communications Commission, 75.3% of Puerto Rico’s cell towers are still out of commission and many of those restored to service are functioning on generator backup, often using portable cell tower infrastructure that offers a fraction of the coverage area normal service used to provide. The majority of restored towers are in the immediate vicinity of San Juan, while many other parts of the island remain totally without service. Claro, a Mexican-owned cell company that used to offer the best coverage across Puerto Rico still remains the most reliable after the storm. All four wireless companies operating in Puerto Rico are offering free roaming to customers so as towers are restored to service, the companies can provide coverage to as many residents as possible. Satellite Cells on Light Trucks (COLTs) have been deployed in Aguadilla, Arecibo, Cayey, Caomo Sur, Fajardo, Guayama, Manati, Mayaguez Mesa, San German, Vega Baja, and Yauco and Terrestrial Cells on Wheels (COWs)/COLTs in Humacao, Quebradillas, Rio Grande, and Utuado. The FCC believes approximately 61% — one percent higher than last week — of the population can now get some cell signal. But that figure is slightly misleading because the largest percentage of the population lives around or in San Juan, the city with the best service restoration so far. In contrast, most cell sites in Texas, Louisiana, Mississippi, Alabama, Georgia, and the Florida Panhandle affected by two earlier hurricanes were restored to service within two weeks. Cellular providers point out the reason for the difference is the availability of commercial power and reliable backup generators, both not widely available in Puerto Rico even now. The U.S. Virgin Islands, also devastated by Hurricane Marie, are also struggling with repair efforts. At least 55.4% of cell towers are out of service on those Caribbean islands, with 88.9% still down on St. John, the smallest of the three islands that make up the U.S. territory. Because repair efforts have been more effective on the other two islands, about 88% of the territory can now get a cell signal. NBC News reported today that 17.7% of Puerto Rico now has electricity, but it is very unreliable and there are daily outages that sometimes extend for hours. The Army Corps of Engineers hopes to have in place by next week — more than a month after Hurricane Maria made landfall in Puerto Rico — two 25-megawatt generators at a plant in San Juan to help stabilize electricity there. The generators arrived Oct. 13, and a target date of Oct. 25 may be missed because of ongoing inclement weather. Once installed, the generators will extend electricity to about 30% of the island — mostly in the northeastern section around San Juan — and stabilize power for those who already have it. The government is prioritizing electricity restoration for public safety and hospitals, public/government institutions including sewage and water treatment plants, schools, and then the island’s large pharmaceutical industry, which own several large drug manufacturing plants. The order of priority the government is giving to service restoration is upsetting Claro, one of the island’s largest cell companies. Andrés wants the power authority to make sure that electric service is restored to cell towers as soon as practical. Residents are being told they can expect 95% electricity service restoration by Dec. 15. Liberty Cablevision of Puerto Rico is only working for about 1% of its customers, so it is focusing on offering free Wi-Fi hotspots for now. Diesel generators are currently powering some of the island’s 911 service centers, which are now back up and running normally. Cable service remains basically non-existent in Puerto Rico because of the lack of electricity. Liberty Cablevision of Puerto Rico has reported it has restored full service to about 1% of its customers, although a significantly higher number will have service back immediately after electricity is restored. Liberty promises automatic service credits for the duration of the outage and has told customers to ignore billing that was already in the mail when the storm hit. 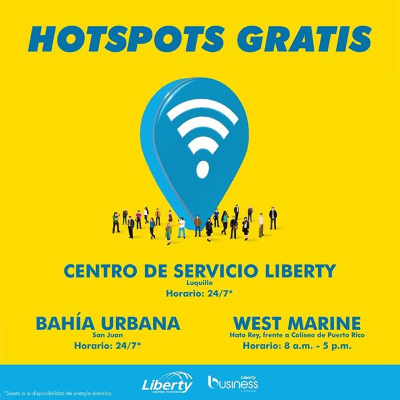 Liberty is currently focused on reaching and retaining the goodwill of its customers with a network of free Wi-Fi hotspots. The island’s landline provider reports there are six central switching offices out of service on the island and there are problems connecting long distance calls. The following TV stations are confirmed operational: WKAQ, WIPR, WIPN, WTIN, and WNJX, but these nine are still off the air: WAPA, WIPM, WTCV, WUJA, WELU, WECN, WRSV, WORO, and WRUA. As of today, 44 AM radio stations are confirmed to be on-the-air: WA2XPA, WALO, WAPA, WBMJ, WBQN, WCMN, WCPR, WDEP, WENA, WEXS, WGDL, WI2XAC, WI2XSO, WI3XSO, WIAC, WIDA, WIPR, WISO, WJIT, WKAQ, WKFE, WKJB, WKUM, WKVM, WLEO, WLEY, WMDD, WMNT, WNEL, WNIK, WOIZ, WOLA, WPAB, WPPC, WPRA, WPRP, WQII, WSKN, WSOL, WTIL, WUKQ, WUNO, WVJP, and WXEW. These 29 AM radio stations are confirmed out of service: WABA, WBSG, WBYM, WCGB, WCMA, WDNO, WEGA, WFAB, WGIT, WHOY, WIBS, WISA, WIVV, WLRP, WMIA, WMSW, WNVI, WOQI, WORA, WOSO, WQBS, WRRE, WRSJ, WRSS, WUPR, WVOZ, WYAC, WYEL, and WYKO. There are 36 FM radio stations back on the air: WAEL-FM, WCMN-FM, WEGM, WERR, WFID, WIDA-FM, WIDI, WIOA, WIOA-FM1, WKAQ-FM, WLUZ, WMAA-LP, WMEG, WNVM, WODA, WORO, WOYE, WPRM-FM, WPUC-FM, WPUC-FM1, WQML, WRIO, WRRH, WRTU, WRXD. WTOK-FM, WUKQ-FM, WVDJ-LP. WVIS, WVJP-FM, WXLX, WXYX, WYQE, WZNT, WZNT-FM1, and WZOL. But these 22 FM radio stations are still out of service: W227CV, WCAD, WCAD-FM2, WCRP, WELX, WFDT, WIOC, WIPR-FM, WJDZ, WMIO, WNRT, WNVE, WQBS-FM, WTPM, WVQR, WXHD, WYAS, WZAR, WZCA, WZET, WZMT, and WZOL-FM3.